Fairgoers at the 2018 Kentucky State Fair were met with over an acre of exhibit space, dedicated completely to Kentucky agriculture and farm families. Logan Boyd (center) is pictured with his family and the buyers of his Grand Champion Market Hog in the 2016 Kentucky State Fair Sale of Champions. Pork Challenge winner Henrietta Booth (holding ribbon) with Pork Garden Vegetable Stew. The smell of barbecue sauces and rich marinades filled the South Wing Lobby as participants in the Kentucky State Fair’s Pork Challenge meticulously plated their dishes. From piglets to ponies and goats to geese, the Discovery Farm in the Kentucky State Fair’s South Wing B is always a crowded attraction. 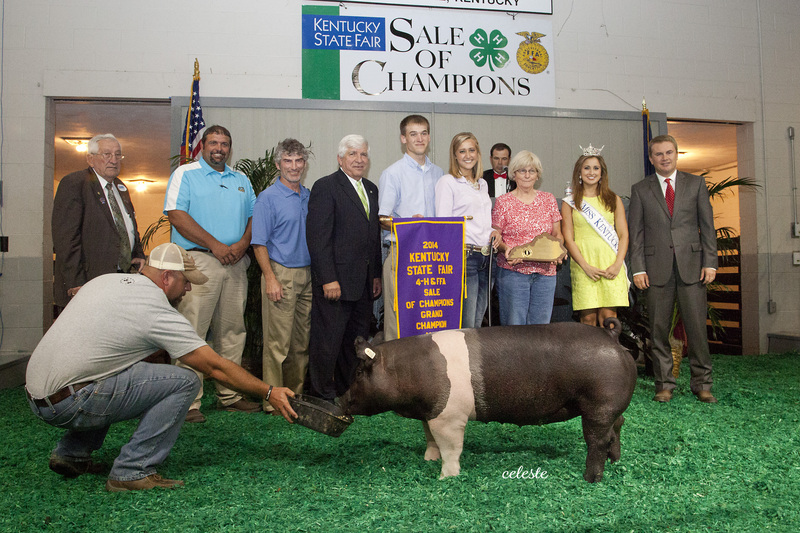 The Kentucky Pork Producers were among the buyers of the 2014 Kentucky 4-H Country Ham which sold for $4,500 at the Kentucky State Fair Commodity Breakfast.